Background: Dendritic self-host phosphorescent Iridium materials, which generally consist of an Iridium light-emitting core, dendrons(branches) and surface groups, are a kind of novel and effective triplet emission materials for non-doped solutionprocessed organic light-emitting diodes (OLEDs). Methodology: Iridium light-emitting cores can harvest singlet and triplet excitons to obtain a theoretical internal quantum efficiency of 100% and can be chosen to determine key photoelectric properties, such as color of light emission. Peripheral dendrons can act as a host of an emissive core. The shielding effect can also reduce or eliminate the interactions between the emitting phosphors and prevent luminance quenching. 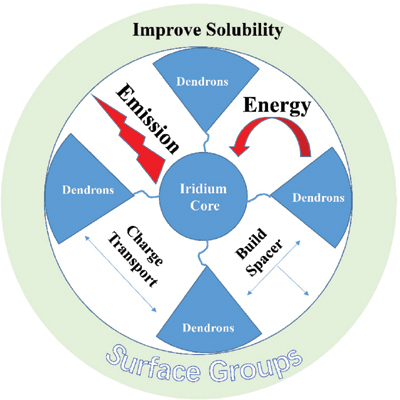 Conclusion: Surface groups can provide suitable solubility for dendrimers in organic solvents. Therefore, phosphorescent dendrimers are applicable to highly efficient self-host solution-processed OLEDs. Dendrimer, phosphorescent iridium materials, nondoped, self-host, organic light-emitting diodes, solution-process.